Draft Spotlight: Robert Turbin, RB, Utah St.
Rundown: Nicknamed “The Turbinator” by some and “Hulk” by others, Robert Turbin is a bruising and highly productive runner from Utah State of the Western Athletic Conference. Random trivia: Out of 67 running backs who performed at the combine, Turbin’s 28 bench press reps was tied for first with Doug Martin and Duane Bennett… Robert Turbin is from Oakland, the same hometown as Marshawn Lynch…. The second highlight video on Youtube for Turbin has the words “BEAST MODE” in its description… Lynch and Turbin have never been seen together… Turbin played his home games at Romney Stadium, named in honor of Mitt Romney’s father’s cousin… I accidentally typed the word “Turban” five times while writing this post. Last season, Robert Turbin rushed for 1517 yards and had 23 total touchdowns (19 rushing). He averaged 6.1 yards per carry, one of the higher rates in the nation. His size, speed, and production are all very close to Ryan Mathews when he came out of the WAC two years ago, and both enter the NFL with some injury concerns. Mathews was drafted 12th overall. Granted, I wasn’t one of Mathew’s biggest fans back in 2010 (I gave him a 3rd round grade), but I don’t see a ton of separation between Mathews and Turbin as prospects. So why isn’t Turbin talked about as a first round pick or at least a top five running back? To be honest, I’m not quite sure. Perhaps its partially because 2012 is a loaded running back class or the fact that seemingly nobody spends much time talking about him. Of course, just because pundits don’t talk about a player doesn’t mean that scouts haven’t already written a book on the guy. Honestly, it wouldn’t shock me if Turbin goes earlier than some big name running backs like Chris Polk, David Wilson or Isaiah Pead. This isn’t to say that I think Turbin is a carbon copy of Mathews, I think a much better comparison would be Marshawn Lynch with less tackle breaking ability and less lateral agility. Turbin is a determined guy and he runs like it. He’s the kind of back that would rather lower his shoulder into a linebacker than try to juke him. Turbin has deceptive speed. His 4.50 forty time is the real deal, but unfortunately it takes him a little while to reach it. Playing in the WAC, his 4.50 speed might as well be a 4.40, as he has runs of 80 and 96 yards in his last two playing seasons. Turbin probably won’t be a regular big play threat in the NFL, but every once in a while he’ll give you a nice sideline scamper- think along the lines of Marshawn Lynch’s 47 yarder against the Giants last year. Other than possible knee concerns, there is a lot to like about Turbin and not much to dislike. For my money he’s a 3rd round talent or better, and if his current level of non-hype is any indication, there is a chance he may last until the 4th or 5th round. Turbin fits very well with Seattle’s philosophy of physical play and it wouldn’t surprise me if he made an impact immediately. There are many running backs I like more than Turbin, but if Seattle waits until the 3rd or 4th round and all the big name running backs are gone, Turbin is an excellent fallback option. He could end up being a steal for some team. Brock Osweiler impresses, first round possible? I’m a big fan of Brock Osweiler. In January I wrote an article arguing why the Seahawks should consider drafting him in the first round. That wasn’t based entirely on need either, it was based on talent. I think Osweiler is worthy of a first round grade. “Osweiler threw 72 passes, with seven hitting the ground. The seven misses were not, however, an indicator of wildness; his accuracy was very good. He presented himself very well, which is important for a quarterback, and interacted well with his receivers. Despite his height, he is very flexible and has a solid throwing platform. Mazzone has worked with him to correct a tendency to drop his elbow, which Osweiler avoided doing on Friday. That’s quite a review for a prospect who’s been generating grades mostly in the mid-rounds. Brad Denny also has a positive write-up for SB Nation and it’s worth checking out. I’ll qualify that I don’t expect Osweiler to be a first round pick. I think he probably should be, especially if Ryan Tannehill is considered a top-ten lock these days and if Christian Ponder can tempt a team to spend the #12 pick on his services. He’s far from a polished quarterback, but I’ve seen enough short/medium accuracy throwing into tight windows, improvisation, ‘x-factor’ throws, a decent arm with potential to become even better and mobility to believe he’s good enough to invest some degree of faith. There are very few quarterbacks I’d wish to start in year one, and Osweiler is no different. However, if I’m trying to find a player to develop and eventually help a team compete then I’m comfortable with the guy. I think he’ll be a solid second round pick. I hope he falls beyond that and becomes an option for the Seahawks, who almost certainly will not draft a quarterback in the first two rounds. But a lot of people disagree with such a positive outlook on Osweiler’s talent and potential. In this video, Michael Lombardi and Charlie Casserly both give short shrift to Brandt’s first round suggestion with Casserley quoting a survey of nine teams – eight of which graded Osweiler in round four. That fourth round grade is the most common I’ve seen among those who make such projections. On the other hand, Brandt has an ally in ESPN’s Todd McShay who has also been beating the first-round drum. McShay’s Scouts Inc. currently has Osweiler as the 29th ranked prospect in the entire draft. So there’s a real discrepancy in grading, which is nothing new when it comes to quarterbacks. Several teams wouldn’t have drafted Jake Locker in round two last year (possibly including Seattle), but Tennessee took him at #8 overall. I suspect Washington and Mike Shanahan were waiting to pull the trigger at #10. The year before, Denver manipulated their position in round one to take Tim Tebow – a prospect many teams didn’t even grade as a permanent quarterback. It’ll only take one coach or GM to believe in Osweiler the same way that Brandt, McShay and myself do and he’ll be a first rounder, or at worst an early second rounder. Just don’t be too surprised if it happens. Personally, I hope the Seahawks were impressed enough to consider drafting the guy in the early second round if the opportunity presents itself. That would need to be a shift in planning, because it certainly appears the intention post-Matt Flynn signing is to address other areas and let Flynn battle it out with Tarvaris Jackson. Essentially, the investment in a young, drafted quarterback would be put back to 2013. I think Osweiler has a shot to be Seattle’s guy, or at least be the guy that can help this team get to where it wants to go. He’s 21, so he has time on his side. A second rounder might be early for a player who wouldn’t be an immediate contributor, but it’d be worth it to at least have another quarterback in the stable with some ‘long term’ potential. As mentioned, there would seemingly have to be a change of plan for this to happen. It seems like DE/OLB, linebacker and running back will be the top three priorities for the Seahawks in the first three rounds. Even so, Osweiler is a player I like and in the right environment and with the right coaching, he could end up being a very productive quarterback. I’ve posted some tape below, so take a look if you haven’t seen it already. Quinton Coples speaks to Bucky Brooks about his pro-day work-out today. Courtney Upshaw also speaks to the NFL Network following the Alabama pro-day yesterday. Bobby Wagner ran a 4.45 at the Utah State pro-day. He’s a linebacker to watch for Seattle in round two, but could sneak into the bottom of the first. Vontaze Burfict ran a 4.85 at Arizona State’s pro-day event. 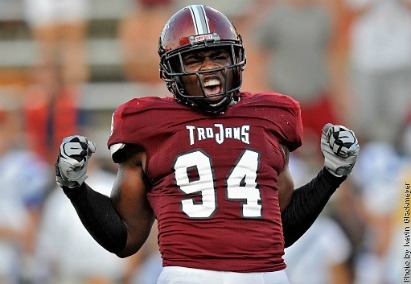 Rundown: Jonathan Massaquoi was a strong side 4-3 defensive end for the Troy Trojans of the Sun Belt conference. He is often listed on draft sites as an outside linebacker (strictly for a 3-4 scheme) despite never really playing in that capacity in college. Excuse me as I wander though the wilderness a bit, I promise the trek will be quick. A few weeks back, I stumbled across a bit of an insider article at Buffalo Rumblings, the SBN site for all things Buffalo Bills. This was a week or so before free agency. The article cited interviews with Bills general manager Buddy Nix and quoted the Bills beat writer from the official Bills website- basically their version of Clare Farnsworth. I won’t link the article or tell you everything it said, because this is Seahawks draft blog and not Bills draft blog, but the gist of it was that Buffalo wasn’t really interested at all in drafting a pass rusher at #10, despite the fact that nearly every mock draft had them doing exactly that. Nix is not exactly a subtle man, and he hardly displayed excitement for some of the pass rush names at the top of the draft, while continually going back to what he called (paraphrasing) “one of the better mid-round pass rush draft classes in a while.” Hearing Nix repeatedly talk up mid round pass rushers, it reminded me a bit of how John Schneider kept repeating the mantra about “not panicking” for a quarterback- both GMs wanted to prepare their fanbases for potentially unpopular moves to come. The article came to the conclusion- and from a fair amount of evidence- that Nix actually had his eye on the mid rounds for a pass rusher and would make up for it by going after pass rushers in free agency. We all know what happened since then. Nix handed out $140 million in contracts for pass rushers, including Mario Williams. Since then, I’ve wondered exactly which mid round players enticed Buddy Nix back then. Bruce Irvin? Vinny Curry? Jonathan Massaquoi? Buddy Nix might not be the best GM in the business, but looking at some of the names that could be had later- I think he has a point on this one. So anyway, back to Massaquoi. Enough bulk and quickness to play either DE spot in a 4-3. In some ways, Massaquoi is a fringe first round talent. In terms of size and length, he’s as good as any defensive end in this draft. His arms were the 4th longest among the 30 defensive ends invited to the combine. He’ll occasionally flash dominance, exploding off the snap and zipping around the edge so fast that the right tackle never stood a chance. Massaquoi has a hint of nastiness to his game too- he’s not afraid to pop quarterbacks, which is really fun- at least until it draws penalties at the next level. He fires off keeping his shoulders low which allows him to get results with a bull rush or inside penetration, so he’s hardly an edge rushing one trick pony. He even blocked a kick on an interior rush last year. If you were to look at how physically gifted Massaquoi is, especially playing for a smaller school, you might assume he had a questionable motor since he could skate by on athleticism. He doesn’t. He gives 100% on every snap. There is something to be said for that. There is one big problem with Massaquoi though, and its probably why a lot of scouts are projecting him as a 3-4 outside linebacker. He doesn’t keep his eyes in the backfield, which often turns him into a liability. Several times a game, running backs will run within arms reach of him, and he won’t even know it happened until its too late. He sometimes also loses sight of the quarterback and will miss opportunities because of it. This is something that is technically coachable- but I wouldn’t hold out much hope of it being corrected. Massaquoi has been playing football for a long time, and even high school level coaches teach defensive lineman to keep their eyes on the ball carrier. He hasn’t developed that skill yet, even after playing football for many years. If used as a 3-4 linebacker, Massaquoi could attack gaps and edges which would be an ideal situation given his speed, burst, liability against the run and his difficulty seeing beyond blockers. If Seattle is willing to draft Ingram or Upshaw and use them for 3-4 looks, they would presumably be willing to do so for Massaquoi as well. I do not expect Seattle to draft Jonathan Massaquoi under normal circumstances. I think they will draft Courtney Upshaw, Melvin Ingram or Quinton Coples at #12 and go about the rest of the draft addressing other areas- particularly linebacker and running back. But what if Seattle gets an offer they can’t refuse at the #12 pick? Its unlikely, but if Seattle is offered a trade package that includes a 2013 first round pick, they’d be hard pressed to turn it down (I’m looking at you, Matt Barkley). I’m sure Seattle is preparing for that situation by having a backup plan in place. Massaquoi could be a part of that plan later in the draft. 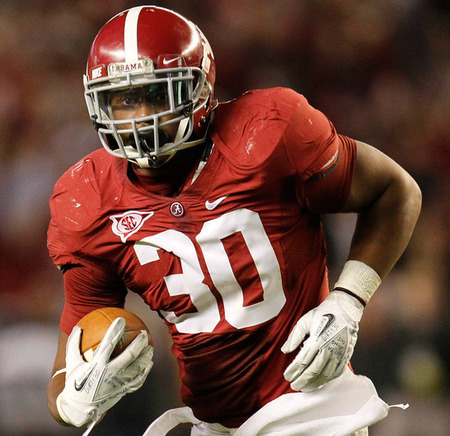 What is it about Alabama pro-day's and shirtless forty-yard runs? Pro-days are largely insignificant events that have minimal impact on the actual draft process. 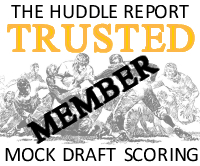 At the end of March, most team’s will feel pretty comfortable with their draft grades and really – how much can you learn from a work out like this? But as modest as these things are, today was about as noteworthy as it gets this time of year. 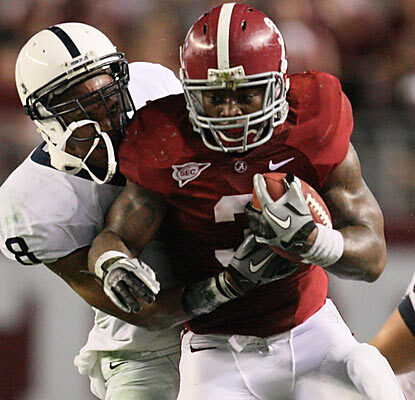 Courtney Upshaw, Trent Richardson and Ryan Tannehill all worked out for scouts after injury-hit off-seasons. So here’s what we learnt. Richardson ran a 4.59 according to SI.com’s Tony Pauline. Or he ran a 4.43 according to ESPN’s Merrill Hodge. Or a 4.49 according to NFL.com’s Booky Brooks. Or a 4.58 according to Rotoworld’s Josh Norris. Basically, we have zero idea exactly how fast 227lbs Trent Richardson can run in a straight line in his underwear. I’m glad we cleared that up. Courtney Upshaw also ran a forty after passing at the combine, but again – it’s a complete mystery what time he actually achieved. Brooks says anywhere between 4.73 and 4.76, Pauline is quoting a 4.78 while Norris is saying it was a 4.81. 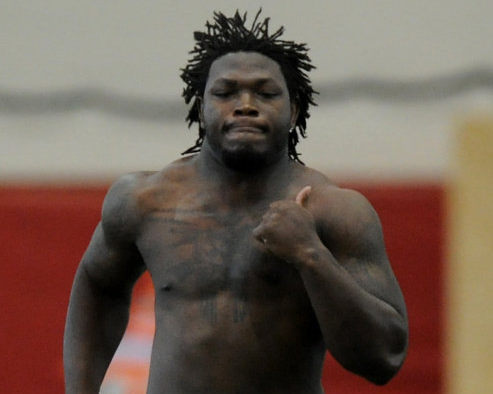 For a post-work out Courtney Upshaw video interview, click here. Pete Carroll and Darrell Bevell were both at the Texas A&M pro-day to see, among others, quarterback Ryan Tannehill. ESPN’s Todd McShay clocked Tannehill at a 4.61 in the forty, a faster time than Andrew Luck. But perhaps the headline news came after the work-out, when it was reported Carroll, John Schneider and others joined the Aggies quarterback and Dolphins representatives for dinner. Before we start casting Carroll and Schneider as Owen Wilson and Vince Vaughn, it seems this wasn’t so much a gatecrashing rather than a pre-arranged get-together. So don’t expect to see the pair at your wedding, uninvited. Predictably, Carroll, Schneider and Bevell’s presence in Texas has kicked up a hornet’s nest regarding the team’s interest in Tannehill. It’s worth noting that Schneider made a personal visit to Ryan Mallett’s pro-day last year (a player not even included on the team’s draft board) and the Seahawks gave Jimmy Clausen a thorough work-out after his pro-day (another player Seattle had no interest in). So while we can only second-guess the team’s intentions, I suspect there was an element of convenience involved (Carroll is conducting a ‘Win Forever’ workshop in Dallas) and taking an opportunity to watch several prospects work-out (including Tannehill and Jeff Fuller – who’s stock is falling nicely into bargain territory). No need to read too much into this. If you’d like to see a lovely picture of Pete and John at the Texas A&M pro-day, click here. 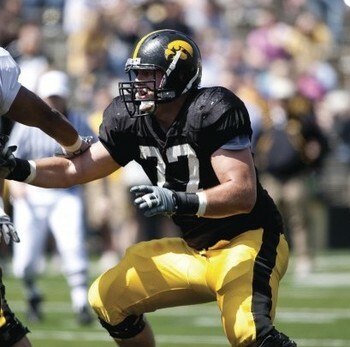 In other news, Peter Konz will work-out for the first time on April 4th alongside fellow Wisconsin lineman Kevi Zeitler. 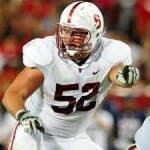 Konz is the best center prospect since California’s Alex Mack was drafted by Cleveland in 2009. Sigmund Bloom has an interesting mock draft including a trade that sees the New York Jets move into the top-10. It’s a very realistic proposition and I would anticipate Jacksonville trying to move down the board if the top-six fall as expected. Todd McShay also updated his mock and added a second round, giving the Seahawks Quinton Coples and Mychal Kendricks – the two players we projected to Seattle last week. If anyone missed the NFL Network’s supposed leak of Seattle’s new logo, take a look here. Danny O’Neil at the Seattle Times has since relayed information suggesting the Seahawks will get a gray alternate jersey. A bit of digging online and you’ll find enough info to get you through to next Tuesday’s big reveal. If you want to believe the internet – expect a mostly navy home look, a white away uniform and a gray alternate. There’s going to be feathers of some kind on the pants and jersey, but allegedly not in the Oregon style. The numbers will be gray on the home uniform and the helmet blue (and look something like this). According to the internet. Let’s look at some tape. Below I’ve added videos of Ronnell Lewis (LB, Oklahoma) vs Florida State, Michael Brockers (DT, LSU) vs Ole Miss and Jake Bequette (DE, Arkansas) vs South Carolina. Thanks to Aaron Aloysius and JMPasq. Veteran readers may recall that in 2010, I did a daily series covering prospects titled “player of the day” or POTD for short. People seemed to enjoy reading them, but in terms of results, it was an abject failure. I covered about 30 or 40 players or so in that series. Only one of them (Earl Thomas) was actually drafted by the Seahawks, and he was a player I almost didn’t include because like most people I was assuming Seattle was only considering six foot plus defensive backs. In my own defense, Rob and I did not yet have a direct pipeline to our inside source (although the source did tell us that Seattle loved “Thomas” before that draft- which I assumed meant Demaryius Thomas). The inside source has been much more generous this year, providing a list of names and front office insights for the #12 pick and the exact rounds Seattle will target certain positions through the rest of the draft, which is a huge benefit to us and makes projecting the Seahawks draft far less of a shot in the dark than two years ago. There was also the fact that Seattle had a ton of needs that year which led to them having a relatively unpredictable BPA oriented draft. And finally, there was the fact that it was John Schneider’s first ever draft as a GM, which was further muddled by the fact that he was presumably taking orders from Pete Carroll, a bit of an unknown in his own right since he swore to do things differently than his previous NFL jobs. When the draft rolled around, the Eagles made a dramatic trade up right in front of Seattle for Brandon Graham in the first round, and the Browns made a big trade up right in front of Seattle for Montario Hardesty in round two. Those were two players I especially liked in my POTD series, so I’ve always felt those events were interesting coincidences. As it turns out, the rest of the league was just as much in the dark about John Schneider’s style and preferences as I was. With some good insider info and two years of experience covering this front office, I’m hoping this year’s spotlights will end up being more accurate. I always thought that “POTD” sounded kind of clunky, so this year I’m changing the name to Draft Spotlight. Expect about four entries a week, possibly as much as six in a week if I have enough time. The goal is to cover twenty or so random players before the draft next month. 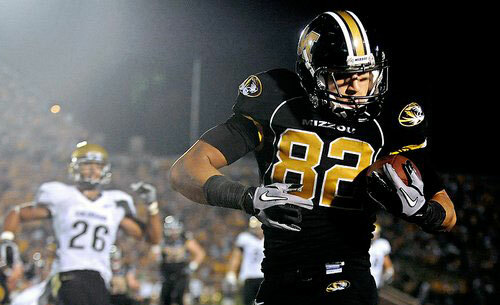 And so today, I’ll begin with Michael Egnew: tight end from Missouri. I want to remind everyone now that most of these write-ups will not be scouting reports. They will more closely resemble a research essay. So please do not take my opinions as gospel, especially not in this series. A year ago, Michael Egnew was Blaine Gabbert’s go to guy. Blaine Gabbert ended up a top ten pick, and Michael Egnew picked up All-American honors before returning for his fourth year. Michael Egnew had 90 receptions in 2010 when paired with Gabbert. Ninety. That is not a typo. Even without Gabbert the Missouri tight end had 50 catches in 2011. To put that in perspective, potential first round pick Coby Fleener had a career high 34 receptions last year. The Megatron-esque Austin Seferian-Jenkins of Washington had 41 receptions last year. The top drafted tight end in 2011 (Kyle Rudolph) never had more than 33 receptions in a season. Jeremy Shockey had a college season high of 40 grabs. The last first round tight end to be drafted (Jermaine Gresham) had a career high of 66 receptions (but only 37 the year before). To say the least, Egnew’s 140 reception total over the last two years is eye catching. There is just one problem. Was Michael Egnew really even a tight end? Below I’ve included a compilation video from Egnew’s 2010 All-American season. Meticulous observers will notice right away that in Missouri’s spread offense, Egnew usually lines up in the slot, and occasionally even as a flanker, but almost never on the line. Now it could just be that Egnew did line up on the line a fair amount, and the video compiler chose to leave those plays out because Egnew did not factor in them. Still, shouldn’t it be worrisome that just about every single reception Egnew had in that video came from him lining up like a wide receiver? Missouri basically treated Egnew as a receiver with the benefit of his being covered by linebackers. Suddenly its no wonder at all that he amassed 140 receptions the last two years. Egnew measured in at the combine at just a hair over 6’4″ and weighed in at 251 pounds, which in case you are wondering is the same weight as the departed John Carlson. Egnew ran a strong 4.62 forty time. It may not be the blistering 4.4s range time that Fleener put up at his pro-day, but its enough to make Egnew one of the fastest draftable tight ends on paper. I have to admit that his forty time is a bit of a surprise though, most scouting reports on Egnew describe him as slow and my own observation of him is that he frequently has poor separation. He also had just 9.2 yards per catch over those 140 receptions the last two years, and low yards per catch is often a good barometer of speed and separation (Mike Williams and TJ Houshmandzadeh are good examples of this). As far as blocking goes (and I’m basing this off of what I’ve read), he’s often described as a guy that tries hard but doesn’t get the best results. If I didn’t know any better, I’d wonder if I was writing a report on John Carlson four years ago. In terms of size, speed, separation, hands, blocking skills, and yards after catch, Carlson and Egnew are pretty damn similar. This is interesting because Seattle just lost John Carlson in free agency, and could be looking to replace him in the draft should an opportunity present itself. But here is a question I have: is Seattle looking to replace John Carlson with another John Carlson? Part of me suspects not. Sure, its reasonable that Seattle wouldn’t want to match Minnesota’s 5/25 deal for Carlson’s services, but what about a 1/5 deal instead? Because that’s what the franchise tag would have cost for Carlson, and Seattle didn’t use it. Seattle didn’t appear to try very hard to negotiate with Carlson before free agency either. Keep in mind that they did this in the same offseason in which they rewarded Red Bryant, a 333 pound defensive end with two career sacks, a $35 million contract. John Schneider has shown that when he wants a guy back, he doesn’t play around. Yet he barely lifted a finger to keep Carlson. I suspect that Seattle’s ideal number two tight end is a guy like Anthony McCoy without the drops. Someone that is strong as a blocker first and foremost and is also a weapon in the passing game. Running the ball will always be the priority for this team, and the tight ends on this roster will likely reflect that. This leads me to believe that Egnew is perhaps an unlikely selection for the Seahawks. If Egnew is hanging around in the sixth round, Seattle might figure “what the hell” and take him, but my instinct tells me that if Seattle does draft a tight end, it will probably be a guy who is well above average at both blocking and receiving. This is not to say that I dislike Egnew, much less that I think you should. John Carlson was a great pickup by Seattle back in 2008. Egnew has a chance to be a tremendous mid-round value. I would celebrate an Egnew selection any time after the 3rd round. Its just that I have a hunch this front office could be looking a different direction at tight end instead. Expected draft trajectory: Rounds 3-5. The defense is nearly there. There’s a lot of talent in the secondary and the defensive line is mostly set since the re-signing of Red Bryant. Two key areas remain unfilled – a further addition to the pass rush and at least one more linebacker. There are the two areas I suspect Carroll was referring to above, and the two key areas I expect to be addressed within the first three rounds of the draft. I think they’re looking for a hybrid to fill one of the gaps – a pass rusher who reads well in space, can play at the LOS, take snaps at defensive end and provide solid run defense. Courtney Upshaw and Melvin Ingram personify that role and in my view, remain the two most likely targets for Seattle in round one. The second hole will be middle linebacker and I expect the Seahawks to follow the league’s trend by looking for speed at the position, mixed in with some attitude and coverage ability.It wouldn’t surprise me if the Seahawks even looked at slightly undersized MLB’s who can move well and play smart. It’s not the orthodox type we’ve come to expect at the MIKE, but times are changing and tight end’s are getting harder to cover. Prospects such as Mychal Kendricks and Zach Brown could be on the radar in round two if available. Kendricks only switched to the middle as a senior and Brown hasn’t played MLB, but options remain with KJ Wright also capable of moving inside. 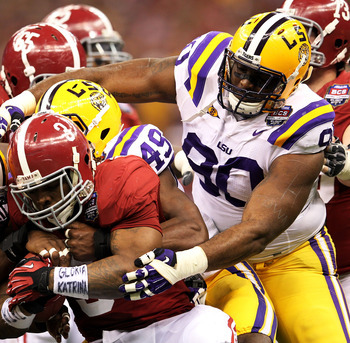 Speed rather than size is quickly becoming the key factor at linebacker in the league. Running back will almost certainly get some attention early because the Seahawks appreciate the importance of the ground game to their offense. Even with Marshawn Lynch re-signed, they’ll need an upgrade at the #2 spot to help carry the load and fill in if Lynch misses time. As with the linebacker position, there will be plenty of options at running back in rounds 2-3. These are the three key areas I envisage the Seahawks looking at, with potential exceptions based on day-two value. The Seahawks currently have six picks in total. For a full run down of the confirmed draft order, click here. Jacksonville provoked the biggest tweak in this week’s projection. Their decision to actively pursue Tim Tebow was an eye-opener – a decision seemingly motivated by owner Shahid Khan’s desire selling tickets rather than building around GM Gene Smith’s vision. Smith traded up for Blaine Gabbert and the fact is he remains part of the team’s future, so it’s time to try and make him the way to sell tickets. The Jaguars employed an offensive minded Head Coach in Mike Mularkey who made use of talented receiver options in Atlanta, and Mularkey is unlikely to be satisfied with just Laurent Robinson as the team’s sole investment at the position. For many weeks I’ve expected the Jaguars to play it safe and draft a pass rusher, which is still a big need. However, the last few days make you wonder exactly who is making the decisions here. Khan may step in again to instruct his staff to draft someone who can be the dynamic go-to receiver they lack. That could mean making a small move up the board to draft Justin Blackmon – let’s not rule that out. But if Blackmon leaves the board before #6 and no deal materialises, could they look to the next best receiver on their board? After weeks of thinking otherwise, maybe it is possible after all? Minnesota won’t waste any time calling Kalil’s name. He has elite potential. The inevitable part III. The Browns have to find someone on offense to build around. Richardson would be the wise choice here. The biggest spenders in free agency, Tampa Bay could still use a stud cornerback. The Rams know this is now a three-draft plan so they need to take whoever is highest on their board with this pick. They want to sell tickets, which means putting an offense on the field that is more exciting than last year’s farce. Is this Plan C? Or are we further down the alphabet by now? 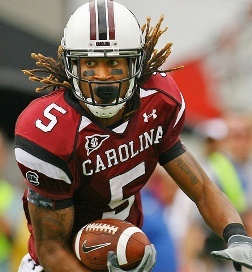 Carolina wants players that will fit into 3-4 and 4-3 looks and Coples fits the bill. The Bills are going to draft an offensive lineman here, the only question is which one will they choose? You can never have too many pass rushers, especially with Peyton Manning now in the division. Seattle needs to find a DE/OLB hybrid who reads well in space. Upshaw fits the bill perfectly. Whoever is playing quarterback for Arizona next year, the Cardinals simply must draft an offensive tackle. The moves made in free agency will allow the Cowboys to target Cordy Glenn or David DeCastro at this spot. One team will fall for Cox’s athleticism and ensure he’s taken early in the first round. This is a fall of sorts given he blew up the combine. Rex Ryan will probably appreciate the potential on offer here. Cincinnati will want to make sure one of their first round picks is a corner, but DeCastro is hard to pass here. With the top offensive lineman leaving the board before the #18 pick, San Diego may fill another big need here. Trading for Brandon Marshall will allow Chicago to concentrate on the best lineman available at this spot. There’s always a few shocks in round one. Konz is good enough to justify a pick this early and will play in the league for a decade. Gilmore’s performance at the combine has seemingly done enough to cement his place in the top-25 picks. 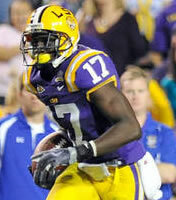 Cleveland needs to keep adding playmakers and could see Wright as a nice compliment to Greg Little. The Lions have built up their interior defensive line, but could look to add another edge rusher here. There are some legitimate concerns about Adams’ play, but Pittsburgh may take a chance. This is now the Peyton Manning show and they could easily go offense here. However, the defense also needs a new leader. Mind-blowing potential given his size, athleticism and hands. He stood out in limited targets during the 2011 season. It’s not like New England to take a running back in round one, but Doug Martin is special. The Packers are running out of options to improve their pass rush and could consider Branch in this situation. Dont’a Hightower looks like he was born to play defense for the Ravens. His ability to line up in multiple spots could attract the Patriots, who are looking for more pass rush. He might be forced to switch to safety. Coverage skills are weak, but he’s solid in run support. Yesterday I was invited to take part in a collaborative mock draft alongside Dan Kadar of Mocking the Draft, Brad Clark of NFL’s Future and Jeff Risdon of Real GM. I’ve posted the results below. I’ll also be updating my own weekly projection tomorrow. This has been the obvious choice since at least December. The only unknown now is how the Colts will surround Luck with talent. The offense needs pieces on the line, the receiver group has been depleted and the run game is only ordinary. It’s a full-blown rebuild in Indianapolis, so they’re fortunate to have a franchise quarterback to build around. Griffin was destined to be a Brown or Redskin. The ‘Skins pulled off the blockbuster and secured their quarterback of the future in Robert Griffin III. With Antoine Winfield nearing the end and Chris Cook’s status uncertain, the Vikings opt to fill the huge need at corner. Their division has three excellent QB’s and legit #1 WR’s and they must shore up the back end if they ever want to compete in the NFC North. The Browns could trade the rights to Kalil for a kings ransom. We’re not making deals in this mock, so Cleveland takes the best player on the board to create an incredible tandem with Joe Thomas. The Buccaneers would be in a tough situation if Claiborne and Kalil are both gone when they pick. That could open them to trading the pick to a team that wants Justin Blackmon. But with LeGarrette Blount sputtering to the finish last season, Richardson would give their offense a sure thing in the run game. 6. 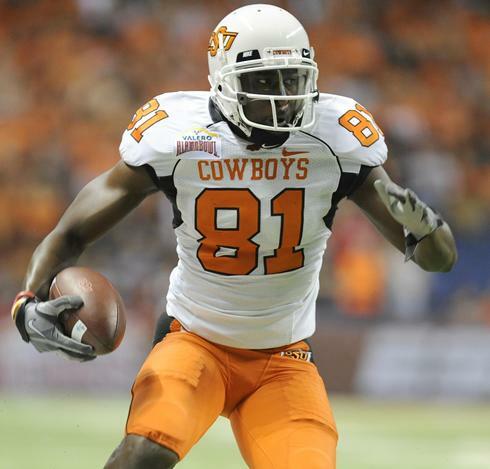 St. Louis Rams – Justin Blackmon, WR, Oklahoma St. They could be trade partners with Cleveland in this scenario for a franchise LT. If they stay put, the cupboards are bare at WR after Brandon Lloyd’s departure to New England. Blackmon could remedy some of the ills for Sam Bradford. They need a pass rushing force opposite Jeremy Mincey. Coples brings great physical tools and versatility to the young defensive front. I’m not a big Tannehill fan but the Dolphins are desperate at the moment and need some positive PR. Drafting a quarterback might be the answer and Mike Sherman’s presence as offensive coordinator could increase the chances of this happening. 9. Carolina Panthers – Fletcher Cox, DT, Mississippi St. The Panthers are bringing in several defensive linemen for visits, including Michael Brockers, Coples and Jerel Worthy. With the team set at nose with Sione Fua, the team needs a left tackle capable of generating a blitz. There are tackles more highly regarded than Cox, but he fills a hole better than others. With the additions of Mario Williams and Mark Anderson the focus is off DE. Issues in the secondary and offensive tackle could be addressed here but I don’t see the value. The offense needs more weapons and Floyd is a perfect complement to Stevie Johnson. Not the biggest need but Ingram has game-changing ability as a pass rusher and has shown he can play in space against the run. Pass rushing depth is a must in today’s NFL. The Seahawks need someone who can rush the passer and fit into a DE/OLB hybrid role. Upshaw is the ideal choice, considering how comfortable he is reading in space. With the top two 3-4 pass rushers off the board in Ingram and Upshaw, the Cardinals may look to upgrade their offensive line. Martin could be used on the left side, shifting the recently re-signed Levi Brown to the right. Jay Ratliff was inherited by Rob Ryan but certainly isn’t what he looks for in the middle of his defense. Poe is a splash selection with a ton of upside which suits Jerry Jones perfectly. Ratliff and Poe become movable parts for a defense predicated on versatility. Lots of different opinions here. Brockers is still learning how to play inside but his is already a very good run defender. He has flashed potential as a pocket-collapsing pass rusher down the road. Brockers fits nicely as part of their DL rotation with Cullen Jenkins and Mike Patterson. Riley Reiff’s still on the board and would make a logical choice at right tackle, but the Jets need a pass rusher. Curry is underrated and could go higher than most people expect. The fall of Kirkpatrick stops here. The Bengals have two picks in the first round and one of them is likely to be a cornerback. Kirkpatrick is a high-end talent who could shift over to free safety in the future. 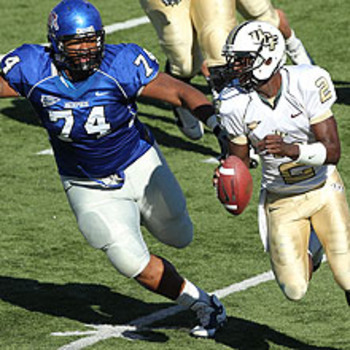 The good news for the Chargers is that Glenn can play both tackle and guard. They need both. Re-signing Jared Gaither was a giant step in the right direction but Jeromey Clary remains a mess on the right side. 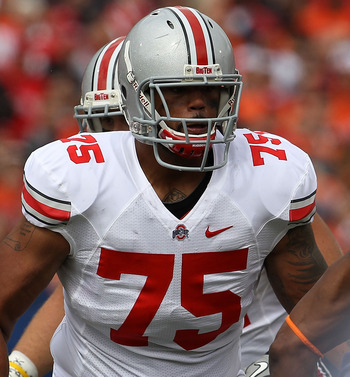 Glenn’s ability to play multiple positions on the OL should be the selling point for A.J. Smith. Very physical corner that fits nicely opposite Charles Tillman in an otherwise thin secondary. Could move to safety if the youngsters don’t pan out, and his perimeter run defense is a real plus. Adding Kamerion Wimbley allows the Titans to consider other needs instead of taking the next best pass rusher. Konz could be another Alex Mack – an extremely talented center to feature at the heart of Tennessee’s offensive line for the next decade. Rey Maualuga has been inconsistent on the field and has some off-field concerns. Kuechly, a local guy from Cincinnati, could easily slide into the middle and the team could jettison Maualuga. Now that the team has signed BenJarvus Green-Ellis, running back isn’t necessarily a first-round need. The Browns need to add playmakers to their anemic offense. Wright showed out at the Baylor pro day after a disappointing Combine performance. With Wright’s ability to stretch the defense vertically it should open up the underneath for Greg Little to work. With Jeff Backus nearing the end and Gosder Cherilus hitting a walk year, the Lions bolster the tackle position with Reiff. I’ve often compared Reiff to a younger Jeff Backus, which makes him a natural fit in Detroit. DeCastro would be good value at this point and fills a need for the Steelers on the offensive line. He could feature in numerous spots, but his best position is probably the one he played at Stanford – right guard. 25. Denver Broncos – Devon Still, DT, Penn St. The Broncos have their pass rushers, but need tackles up front who can occupy blocks and play the run. Adding weapons for Peyton Manning will be intriguing, but the team won’t win unless it can improve its overall defense. The Texans have failed to find a legit weapon opposite Andre Johnson for years. It all changes in 2012 with the addition of Hill. Hill’s as raw as they come but too much potential to pass at this point in the draft. The Patriots use the Mark Ingram booty on Mercilus, an edge rusher to fill the role of the departed Mark Anderson and his double-digit sacks. Mercilus had 22 tackles for loss, 16 sacks, and 9 forced fumbles in 2011, his only good college season. 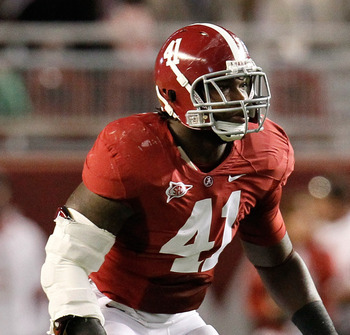 The Packers need a pass rusher here and Branch is the best fit for their 3-4 defense. He’s not quite got the production of Mercilus at #27, but he has a nice initial burst and underrated technique. 29. Baltimore Ravens – Kelechi Osemele, OG/OT, Iowa St. Along with losing Ben Grubbs via free agency, the Ravens have an aging Bryant McKinnie at left tackle. Osemele would be a player the Ravens could use inside at guard or move outside when McKinnie leaves if Jah Reid is ineffective. Athletic TE’s are in vogue in today’s NFL. Delanie Walker will likely be gone after this season leaving Vernon Davis the only option in an offense that relies on two tight ends. Fleener can be used in a multitude of ways with his athleticism. Fleener won’t make a living in-line but he won’t need to in Harbaugh’s system. The thought of a Fleener/Davis duo is mind numbing. 31. New England Patriots – Jerel Worthy, DT, Michigan St.
Worthy is a hot-and-cold player that can dominate as an interior rusher when he’s on his game. Vince Wilfork is the only DT under contract beyond 2012, which makes getting quality reinforcements a bigger need than most perceive. Personally, I’d draft Doug Martin or Dont’a Hightower. However, I think the Giants will wait on a running back or linebacker and consider other options here. As long as he’s healthy, Mark Barron is still good value and he had a tremendous 2011 season. Coby Fleener a Seattle sleeper? Stanford tight end Coby Fleener made headlines at Stanford’s pro-day last week, running times in the 4.4-4.5 region at 6-6, 247lbs. He missed the combine due to rehab on a high ankle sprain picked up in the Fiesta Bowl. Pass-catching tight ends that can stretch the field are en vogue at the moment, largely thanks to Rob Gronkowski and Jimmy Graham. You’ll hear a lot of talk about how Gronkowski only ran a 4.65 in the combine in comparison, but it’s worth noting he’s 20lbs heavier than Fleener. Even so, he doesn’t necessarily have to be as spectacular as Tom Brady’s favorite target to be a success. The Seahawks have placed a lot of emphasis on the tight end position since Pete Carroll’s arrival in Seattle, drafting Anthony McCoy and then signing Zach Miller to a $34m contract. Unfortunately, despite the teams best efforts, they’re yet to find any legitimate production from their TE’s. Miller managed just 25 receptions for 233 yards last season with zero touchdowns. John Carlson similarly struggled for production in 2010, while both Cameron Morrah and Anthony McCoy have battled injury and inconsistency. Of course, a lot of this is down to the emergency blocking responsibilities during multiple injury crises on the offensive line. Even so, it appears the position remains one of serious priority. The Seahawks hosted Jacob Tamme and Visanthe Shiancoe recently, while they reportedly had interest in Washington’s Fred Davis (a former USC Trojan) before he was franchised by the Redskins. Pete wants a TE. So the hunt is on to find a greater compliment to Miller. It’s been apparent from day one of the Carroll era that he wants to use a lot of 2TE sets. The offense is being built around the run, so having a lot of 2TE formations is no real shock. Finding TE’s who can block well and also get downfield quickly and help exploit play-action will be crucial moving forward. Considering the free agent market has so far failed to provide a solution, there’s a possibility the Seahawks will look to draft. That doesn’t mean Seattle will necessarily take a tight end early, but if the right one is available – who knows? Fleener’s stock-busting performance last week probably secured his position in round one. San Francisco would like another tight end, so would the New York Giants. In fact there are multiple teams from Philadelphia at #15 onwards that could draft the guy in the first round. If there are GM’s and coaches out there looking for their version of ‘the Gronk’, they might take a chance on ‘the Fleen’. But what if he slips through the cracks, and actually makes it to the top of round two? After all, prior to his workout nobody really expected him to be a first round lock. I’ve touted him as a firm second round prospect, as have a lot of other mock drafters (can we use that as a word?). Seattle’s priorities in rounds 1-3 are likely to center around DE, RB and LB – and I think it’s almost certain a pass rusher will be taken at #12. Beyond that? Maybe things are a little more flexible, especially if value matches need. Fleener falls into that category and for that reason he’s one to keep an eye on. As expected, the Seahawks didn’t receive any compensatory picks today. Last year’s free-agency splurge on the likes of Sidney Rice, Robert Gallery and Zach Miller ended any chances of that happening. For a full list of what the NFL dished out, click here. It means the Seattle currently only has six picks in the 2012 draft – their own choices in rounds 1-4, a 6th rounder and a 7th rounder acquired from Oakland for Aaron Curry. They traded their 5th choice to Buffalo as part of the Marshawn Lynch deal and their original 7th choice to Detroit for Tyler Polumbus. The last couple months, we’ve talked quite a lot about pass rushers. Especially Courtney Upshaw. We’ve spent a lot of time covering quarterbacks, linebackers and running backs too. 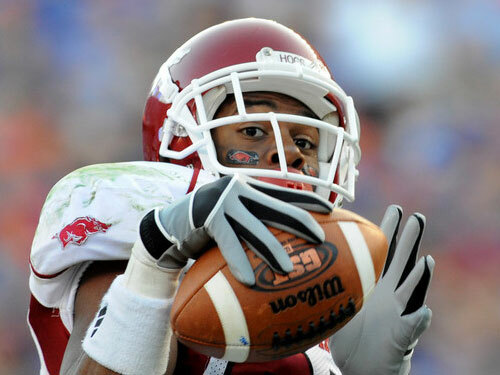 One player who might provide some inspiration for Williams is Arkansas wide receiver Greg Childs. Before suffering a patella tendon injury in November, the 6’3″, 219-pound wide out was among the best skill position prospects to play in Fayetteville in the past decade. A healthy Childs possessed hints of Chris Henry’s untapped athleticism. Whispers of Andre Johnson’s inside-out, physical style. Echoes of Randy Moss’ deep prowess. His game made my colleague Cecil Lammey exclaim, Child Pu-lease! Childs returned to the team after surgery and wasn’t even sporting a brace. However, he wasn’t the same player. I watched him against LSU this year and he looked like he might as well have been running in a pool. Many observers believe Childs looks like the player he was before his career near-death. If you didn’t see Childs before his injury, here’s a glimpse. I don’t know if Seattle plans on drafting a receiver this year; we already have eight on the roster and the team will only keep six next September. That said, Childs does seem like the kind of low cost / high reward reclamation project this front office has been fond of in the past. Though he had a different career path, Doug Baldwin was also a good college receiver who’s stock was impacted by injuries. Seattle obviously benefited from taking a chance on Baldwin. Seattle took a similar gamble on Walter Thurmond the year before that and has seen promising returns with that pick as well. The Leon Washington trade is yet another example. Sometimes you show up to watch one player and end up noticing someone else in the process. I remember scouting Ryan Mallett last year and discovered Knile Davis. Greg Childs caught my eye as well to a lesser extent.. I’m kind of surprised that I completely forgot about him until I read this article. 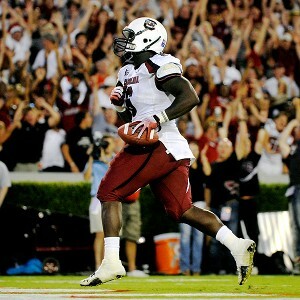 Childs may not have had a good 2011 season due to injury, but its true that he was a force in 2010. Below I’ve provided a couple of compilation videos from Childs’ 2010 season.